A colleague asked me about sources of free text books or publications on power distribution and generation, as one of his retired relatives was interested in staying up to date in the industry. After a bit of searching I found the following publications. These are a good alternative to commercial journals or text book publishers to get a flavour. Int J. Elec. Power Sys. Power companies in Australia tend to keep their information close to their chests. There are however a number of good places to obtain useful information. Here are links to spatial data, load data, and network data. 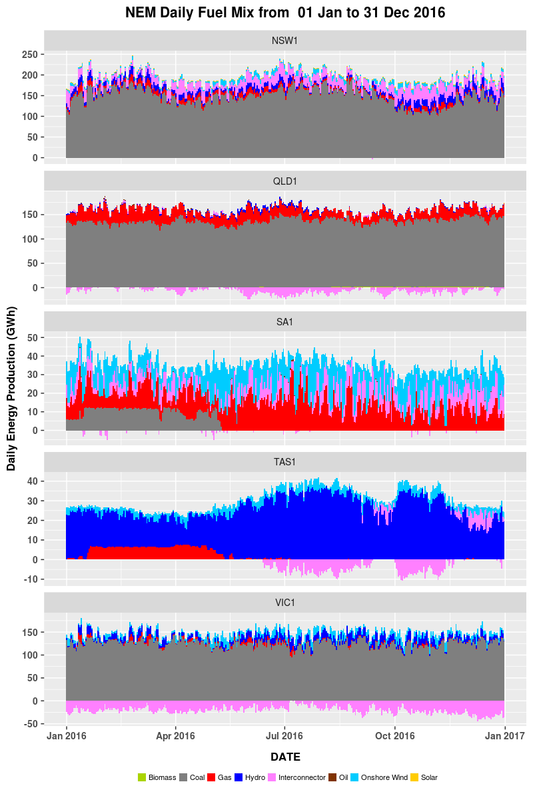 Energex data is available as of 4 March 2019. Distribution Network Service Providers are required to provide 10 years of load data to interested parties. Some charge for this, others require a form to be completed and others allow direct download. These instructions are intended to help you start using the Endace DAG cards. They are not endorsed by Endace, and if you’re stuck then you should refer to their manuals or contact their technical support people (who are quite helpful). These instructions are based on the DAG7.5G4 PCI Express card. Endace only support the Finisar SFPs. Others do work, and I’ve used a Cisco 10/100/1000 SFP that was borrowed from the IT department. The DAG cards do not support 100BASE-FX SFPs – the only fibre interfaces supported are 1000BASE-X. If you need to monitor 100Mb/s fibre links then you will need a media converter, but any timing measurements need to take into account the latency of the media converter (which are often two port switches). If all you want to do is capture frames then set the card up as receive only, fix the ports to the correct rate and you’re done. Most of the time auto-negotiation of duplex works fine, but things do get messy with taps and half duplex devices. Now it is time to capture some frames. dagsnap does this for you, but a trap is that it can also store data that has arrived in the meantime. The dagbits command can be used to clean the buffer out first. Wireshark is a very easy way of viewing ERF files since it supports them directly. Converting the ERF file to a PCAP file with dagconvert reduces the time stamp accuracy. If you capture from multiple ports at once all the frames end up in one file, but the receive interface is stored in the ERF header. Adding a custom column to Wireshark that has the custom field erf.flags.cap makes it very clear where the frames came from. Colour coding based on the interface also helps. Two filters are needed to ensure frames that are tagged with 802.1Q are also captured. Filters can be set up for particular source or destination addresses too. The only way of going back to the user/updated firmware is to reboot the computer. The DAG7.5G4 is capable of transmitting and receiving data at the same time. There are some extra setup steps required though. These involve setting up the buffer memory and disabling receive for an interface or two. The data to be transmitted needs to be prepared properly. The DAG card transmits ERF files, and this means it can transmit from multiple interfaces. The simplest way is to replay a captured file, but you can also convert a PCAP file to ERF and specify which interface should be used. A trap is that the ERF data needs to be aligned to 64 byte boundaries, and this is managed by dagconvert. I haven’t replayed ERF captures, so this example will take some synthetic PCAP data. The maximum buffer memory is 128MB, and this needs to be shared with receiving too. The DAG card is very efficient, and even 1MB of receive buffer is enough to capture 100Mb/s data on two ports (total of 200Mb/s going to the disc). The maximum ERF file size I’ve reliably been able to transmit is 125Mb. There may be tricks to work your way through a larger file, but I haven’t had much luck. To transmit and receive, you will need to console windows. It is a good idea to wait until the dagbits command has finished before running the dagflood command. I give the dagsnap and extra 10 seconds or so, I wait until it has started capturing some data and then start dagflood. These designators are taken from ACMA radio registrations and manufacturers' data sheets. Now that 2016 has come to an end I thought that it would be interesting to look at trends and changes in the way electricity was generated around the National Electricity Market. There have been a few significant events in the past twelve months in the electricity sector. If you have suggestions or requests for other visualisations please let me know (via the contact page). I have 5-min SCADA data for each generator, so there is no shortage of information available. Mostly coal and interconnector imports from Queensland (black coal) and Victoria (brown coal). New solar PV stations are a good thing, but their output is lost in the noise compared to coal and interconnector imports. Interconnector to NSW flows south most of the time. Some renewables, but insignificant compared to the coal and gas. Does not show the rooftop PV contribution to load---this is the nett generation required. Coal-fired generation ceased in May. Gas generation (thermal and gas turbine) is now the only synchronous generation in service. Wind power is a significant part of the state's energy mix. The interconnectors between SA and Victoria generally flow west, increasing the carbon intensity. Significant gas generation needed early in the year while Basslink was out of service. Basslink has generally flowed north, taking hydro power to the mainland. The interconnector does flow south at times of low hydro output, providing the backup that Tasmania needs (but from brown coal). Hydro generators provide a great synchronous reference, so capacity for extra wind is high. Even with imports from Tasmania, Victoria is a net exporter (to SA and NSW). Brown coal is cheap, and will generally displace gas and black coal. Wind and hydro are not insignificant, but are dominated by coal generation. 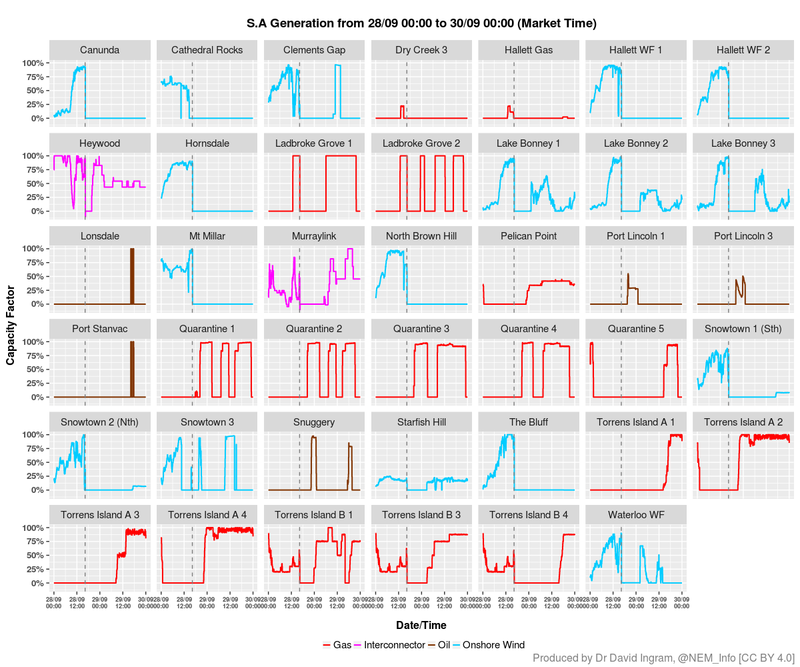 I have generated a new graph of the S.A. blackout and restoration, this time including interconnector flows too (suggestion from James Hazelton).